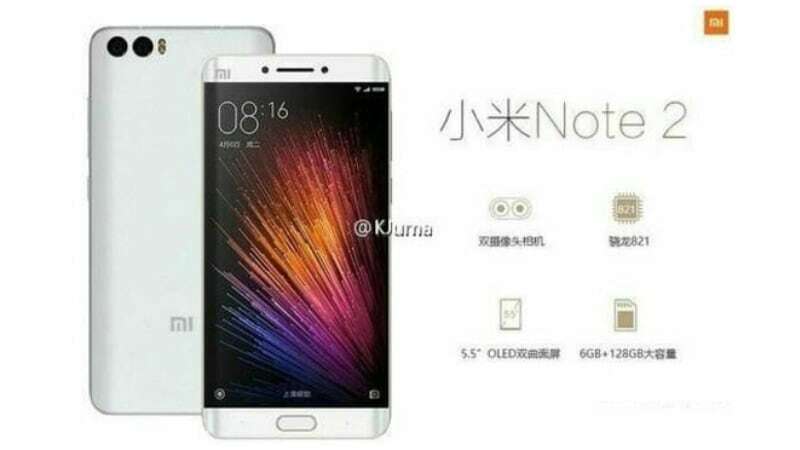 Xiaomi Mi Note 2 has seen its fair share of leaks in last few weeks. After the rendered images of the alleged smartphone were leaked last month, reports now suggest that the smartphone has been certified by Chinese certification authority 3C. This means that the rumoured launch date of September 14 might indeed be true for the Xiaomi smartphone. According to a report by Playful Droid, Xiaomi Mi Note 2 has been officially certified by Chinese 3C authority and now only requires Tenaa certification before it can be officially sold in the country. Past leaks suggest that Xiaomi Mi Note 2 will sport a dual-edge screen (like Samsung Galaxy Note 7) and a dual camera setup at the back. It is expected to come in an all metal body, and pack a 5.5-inch Oled screen. The smartphone is expected to come in 6GB RAM/ 128GB storage and 6GB RAM/ 64GB storage bundles and is expected to be powered by a Snapdragon 821 chipset. The phone is also suggest to have a USB Type-C port, 3600mAh battery, two speaker grilles, and a fingerprint sensor at the front.